Are you done with dieting? Would you like help to understand your overeating or bingeing? Do you want to work towards making peace with food and improving your self-esteem? Would you like to share your experiences and hear the experiences of others with similar struggles? 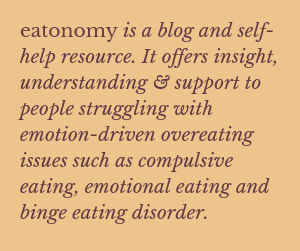 If you’re looking for help, understanding and support for your overeating issues, and are within reach of central Norfolk, we’d love you to join us at our monthly eatonomy group. The group session is held on the last Saturday each month and is open to women aged 18+ who are struggling with emotion-driven overeating issues such as compulsive eating, emotional eating and binge eating disorder*. The topic of the monthly question blog post is the focus of discussion and you’ll be encouraged to reflect on and explore your thoughts, feelings and eating behaviour. To be eligible to join the group you need to be an eatonomy subscriber so be sure to click the “Follow via email” button – you’ll find it at the side of the page for desktop, and at the bottom of the page for tablet or mobile. It’s free to subscribe and your email address won’t be shared or displayed. It just means you’ll be emailed every time something new is published. Please note that this is not a weight-loss group. We don’t offer “tips and techniques” to help you adhere to “healthy eating” or a diet. It’s very clear from my blog posts how I feel about dieting and the damage that it does to us both physically and psychologically (click here to read more). Instead, this group is an opportunity to share your experiences with like-minded people in a safe space and find ongoing support to help you move towards making peace with food and yourself. For information about venue, cost and other details, and to book a place, please email using the contact form. If you wish to take part in the group, you’ll be asked to complete a short questionnaire. For the date of the next eatonomy group meeting, please see the News page. If you’re too far away to attend the group, you could think about starting your own monthly eatonomy self-help group in your community. If this is something you’d like to do then please let us know – we’d love to hear from you. *For UK support groups for men with eating disorders, click here for a link to Men Get Eating Disorders Too. *If you’re under 18 and suffering with this issue, click here to find support near you. *Please note that this group is specifically for people struggling with overeating issues who don’t compensate for their overeating or bingeing by purging, over-exercising or taking laxatives. Therefore, it’s not suitable for those suffering with bulimia nervosa. For a list of UK counselling and support resources for bulimia and other eating disorders, please click here.